Last month Toronto’s newest park, June Callwood Park, opened just south of Fort York. 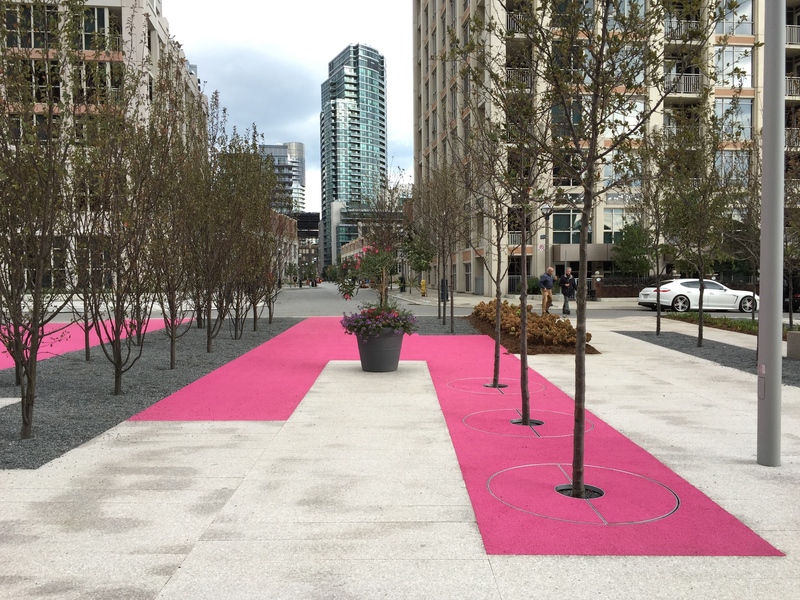 Designed by gh3, it’s a beautiful plaza with granite pavers, trees, and, its most eye-catching feature, bubble-gum pink elements threaded throughout that will find much love on Instagram, I’m sure. And yet, after visiting the park I felt disappointed. June Callwood Park seems like a park that lives more for its design than for its people. As a piece of art, or a theatrical set, the park is wonderful. It has a compelling narrative behind its design in recreating the sonic waves of a June Callwood quote (“I believe in kindness”) in its granite pavers. 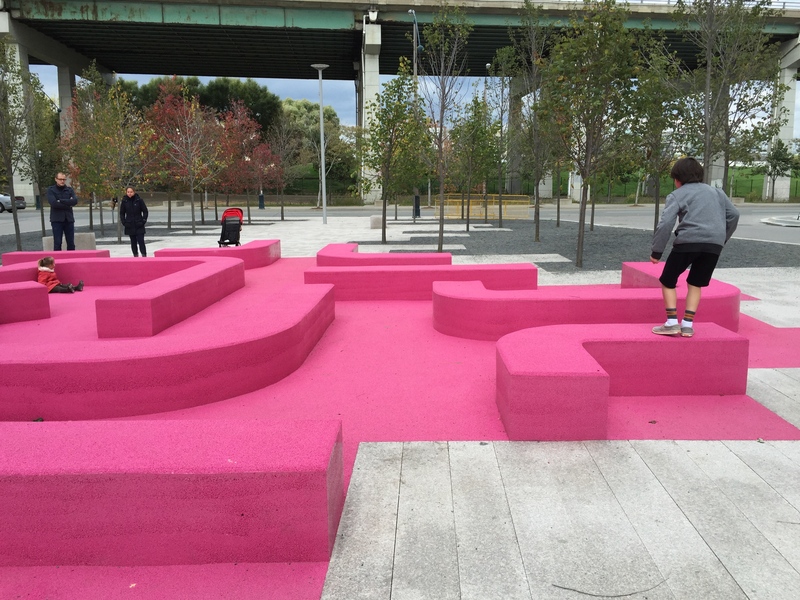 Its pink highlights add the whimsy often lacking in Toronto parks. But the park doesn’t make me want to stay and linger. In fact, it seems designed to let you flow through it and come out the other side with a few good pictures (though kids did seem intrigued by the pink maze-like structure). It’s not fair to really judge a new park before its had a chance to integrate itself into the surrounding community, though. Often people will find weird, creative, unintended uses for a space. This may happen at June Callwood Park. Maybe they’ll add more seating. Maybe the trees just need to grow taller. But hyper-designed public spaces seem to disinvite participation, which I think is a crucial part of a successful park. People need to feel they can make it their own, adopt it and hack its elements to suit their own needs. When a park’s design is so fine-tuned and seemingly perfect already it presents itself as a toy which, rather than being played with, should instead be left in its packaging and admired from afar. That’s not to say that the design of June Callwood Park is perfect. In fact, there are some key issues. One is that the gravel tree pits are flush with the granite of the park, meaning that small gravel pieces are already scattered throughout its surface. Another is that small changes in grade in the park’s south end create two inch lips that are hard to see and will present accessibility issues. We should want our parks to be beautiful. We should advocate for designs that are unique, whimsical, and bold. But we also need to be sure we aren’t creating museum pieces, but spaces that can be used and lived in. I saw this “park” late in 2015 and got me wondering. Why was it created? It seems like an innovative use of dead space, something more befitting a design for a creative use for any space under the highway. 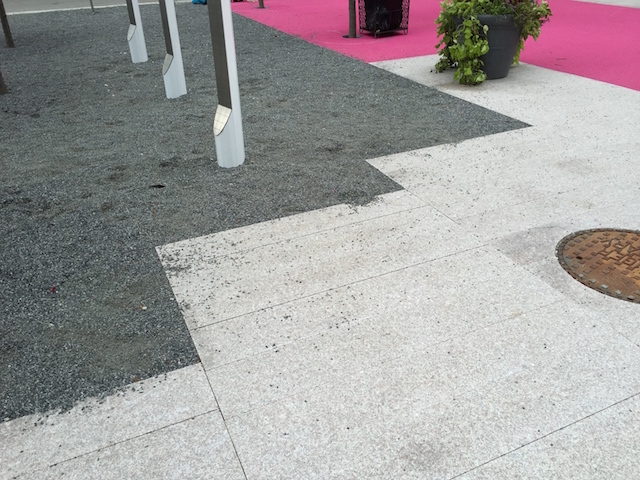 I’m perplexed to why they’d remove green viable green space for concrete, abet colourful. A blog about open spaces, large and small, mostly in cities, but sometimes not. Written by Jake Tobin Garrett, a writer in Toronto who works as manager of policy and research for Park People.